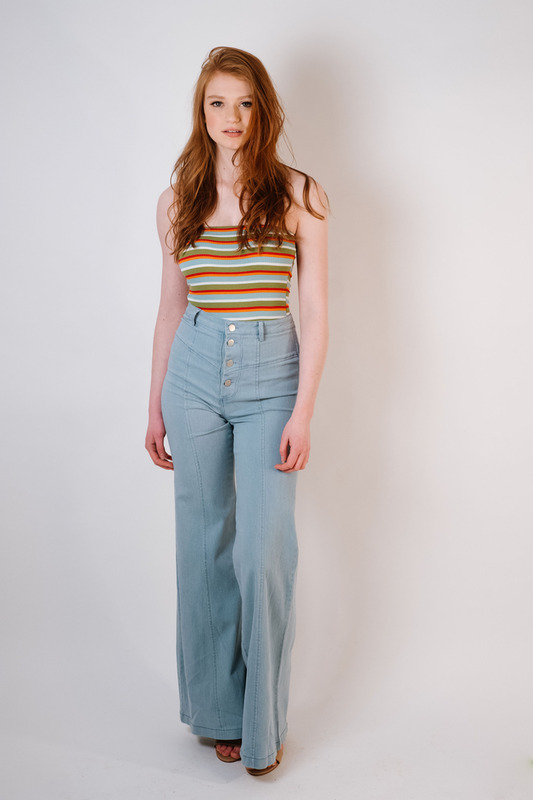 Olive, red, orange, white, and light blue striped tube top bodysuit with thong style bottom, no snaps on bottom. Bodysuits are FINAL SALE. Model is wearing a size small. Black ribbed knit sleeveless halter top bodysuit with cross back adjustable straps and thong style bottom with snaps. BODYSUITS ARE FINAL SALE. Model is wearing a size small. Black and white striped adjustable strap bodysuit with underwire cups. Model is wearing a size small. Stone ribbed v-neck long sleeved bodysuit. Model is wearing a size small.